Notes: I received this book from the publisher to review. Despite this, my review is not biased in favor of the book. Any opinion offered here is completely my own. My thoughts: I approach books like these very carefully. I did a bit of background about Holmen before I started reading the book, and began in earnest after I satisfied my curiosity. This book is a number of things. It is well-researched; Holmen clearly has a solid background in early Christianity and religious history. It is also well-written. When reading about Paul—or Paulos, as he is referred to in the novel—I felt that I had a more personalized understanding of who Paul was. Often accused as being anti-Semitic or a problematic Jewish Christian, Holmen addresses these issues. But more importantly, he presents Paul as human. Paul is as subject to human desires, human complexities, and human experiences as the rest of us. The best kind of book, in my opinion, is one that prompts you to think more, to pursue more knowledge. This book definitely incited that curiosity in me. Some readers may worry that this book revolves around Paul's purported conflicted sexual orientation, but even devoutly religious individuals will find Holmen's handling of the matter to be deft. 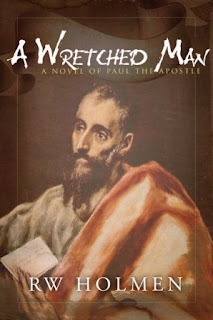 Some may even find Paul's reluctance to engage in supposedly unclean acts to be a testament to his faith. I would say that if this matter is the issue holding you back from reading this book, it shouldn't be. You may be pleasantly surprised. While it might help to have some understanding of this time period or the religious and political issues at hand during and immediately after Jesus' death, it's not necessary. I found this book to actually be quite a good accompaniment to my studies of Jesus as a social revolutionary, upsetting the status quo. I felt like I gleaned a new understanding of the early Judeo-Christian world, which is pretty astounding after having taken four years of academic religion classes. Moreover, I'm curious to speak to the author. What's next after this? How did his background inform his writing of A Wretched Man? I'd be curious to see how Holmen would approach Saint Augustine, but alas, I doubt he is that interested in Augustine, as Holmen is Lutheran. This sounds fascinating! I love reading literature about biblical figures. Great review! I love it when books offer a new way of understanding a period in history. This is something I'll have to check out. Here's an award for The Broke and the Bookish: the One Lovely Blog Award. You can find it here: http://audiblecandy.blogspot.com/2010/08/my-first-blog-award.html Thank you all for writing such interesting reviews (and keeping my TBR pile overflowing)! Thanks for your great comments, Jamie and Entish! Yeah, this book is really great. If you've ever read The Red Tent, you'll really enjoy this book as well! I'm planning on reading The Red Tent! I've heard it is fascinating! I've taken so many classes about the OT & NT but sometimes a good old fashion book gives me more of a sense of the times.